"I can't say how wonderful it was to work with Elli for our engagement photos and wedding. From our first meeting, I felt like she was a friend and completely understood our vision for the wedding. She was always very efficient in responding to emails, was flexible, supportive and a total joy to work with. Countless wedding guests and family members commented on how effortless the photography at the wedding was. Elli and Sarah were so unobtrusive and sneaky with the photos at the wedding -- we couldn't believe how many precious moments they captured. We never felt like we missed out on the day to take photos, it was all a seamless part of the day. To top it all off, the photos couldn't be more lovely. We can't recommend Elli enough!" "Elli is a rare gem - personality & talent-wise. She takes the time to get to know you, and has a true sincerity that comes across both in person and in her work; not to mention, she makes you feel super comfortable along the way. For me, having a photographer that I trusted to do a phenomenal job was a big deal, and Elli most certainly did NOT disappoint. She is a true professional that produces stunning work, and has a heart of gold." "There are not enough words in the dictionary to describe how AMAZING Elli is. Not only is she probably one of the best photographers in NC (possibly in the country), but she's also one of the kindest people you'll ever meet. I first met Elli when she photographed a close's friends' wedding that I was in. I absolutely fell in love with her and those photos, but when it was time for me and my husband to get married, we got suckered into going with the photographer that the venue recommended (big mistake). Suffice it to say, we were not super thrilled with what that person did. Flash forward 9 months later and Elli is taking the photos of us that we always wanted; it was the first time we had pictures that truly represented who we are and the love we have for each other. Elli just "gets" her clients. No matter what you're in to or what your event represents, I guarantee that she will capture all of the love and beauty that she sees through her camera lens; I promise you won't have one bad photo." "Elli is fantastic! I was first introduced to her at a friend’s wedding and their pictures blew me away! Now that we have received all of our wedding photos I couldn’t be more thrilled! Elli takes the time leading up to the wedding to make sure every detail is covered. In our meetings Elli was thorough and covered details that I had never thought about. Elli is very flexible and quick to return emails with last minute changes or questions. Elli is also genuinely excited for her couples and I feel that that really sets her apart from everyone else!" "I could not be more thrilled with my choice in photographer. Since Day 1 of communicating with Elli, she's been super friendly, warm and personable. I've never had professional photos taken before doing our engagement shoot and was worried about feeling weird and posed. Elli was relaxing and laid back and let my fiance and I just hang out and yet she came out with beautiful, amazing, candid photos. I just recently got our photos back from our wedding and I am literally in amazement at how fantastic they turned out. She has a gift when it comes to turning what looks like a plain backdrop into some sort of fairytale in the end. Her second shooter Sarah that came with her to our wedding was as equally friendly and great and I couldn't have picked a better pair to shoot our wedding. I haven't stopped getting compliments on our photos. Hands down the best!" "I couldn't imagine our day being any more perfect with Elli being there. From our engagement pictures, my bridals, to the actually wedding and reception, she outdid herself. I got to see every moment I missed and relive all my favorites! Elli was incredible, patient, fun, talented and 100% the best choice! Thank you so much! We will cherish these photos forever!" "Elli is absolutely amazing. She is talented, flexible, communicative, and such a lovely person. We hired her for our wedding, but she also did our engagement and bridal shoot. Elli brought a second shooter to the wedding and she was a fun person as well. If you're looking for someone who is quirky, creative, down-to-earth, and fun, Elli is your girl. Not to mention, her photos are beautiful!" I could not imagine working with another photographer and being nearly as pleased as I am with the images she produced of our wedding day. She is amazing to work with! Very receptive of any ideas and requests and thoroughly creative in her work. We loved every second of working with her for our wedding and cannot recommend her enough. We absolutely love every single picture, and I especially appreciated her calm disposition on the most stressful/most exciting day of my life. We would not have wanted anyone else as our photographer. We can't thank you enough!" "Elli is one of the reasons that my wedding was the best day ever. She was calm, lovely, graceful, and collected. She knew what she was doing, and her attention to detail was magnificent. She really was my rock throughout the day! Her level of involvement was also ideal, because the questions she asked and the plans we made really helped me to shape the timeline of the day. 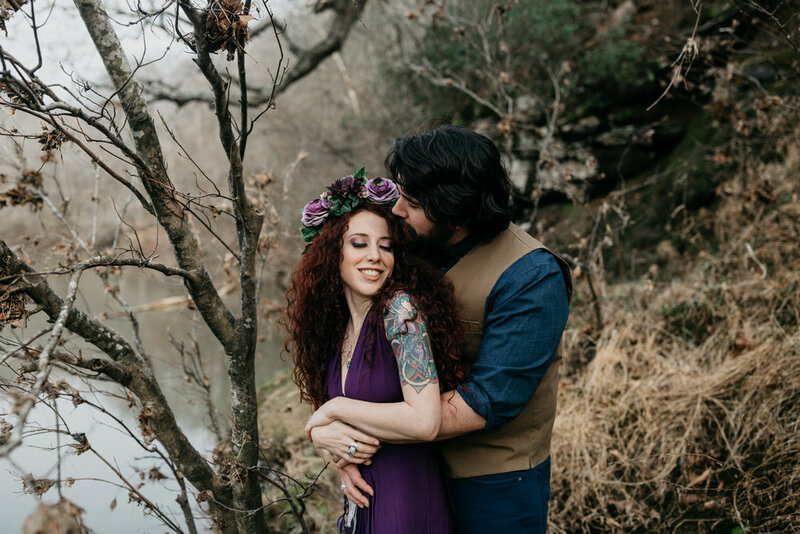 I love looking at our pictures and reliving the dreamiest day that Elli captured perfectly. I can't recommend her highly enough! If you want photographs that are gorgeous, true, and full of your unique personality, this is the way to go!" "Elli is an AMAZING photographer and so awesome to work with! She has great attention to detail, and her ability to capture those candid moments is like none other!" "Elli's ridiculously gorgeous aesthetic is centered around a passion for candid shots. Un-staged and un-posed, her most remarkable photographs capture life's real moments, the hundreds of pieces that make up the mosaic of life. Her photos are raw and genuine, just like her methods during a shoot. Elli's eye for capturing light and snapping elegant angles helped get across the concept we were seeking. I am pretty open in front of the camera, but Elli's ability to ward off awkwardness and discomfort is a huge part of why her process is so successful! Her philosophy relies on just letting you be you, whether it is you as a singular subject, you with a significant other, or you with a family. The moments that get captured are true to the spirit and quality of your relationship with those people or with yourself. It is authentic and fun, everything a photo shoot should be! I'd give Elli 6 stars if I could. I'd recommend her to anyone looking for a beautiful candid experience!"